Breakfast at Wildwood Waffles in Rio Dell. 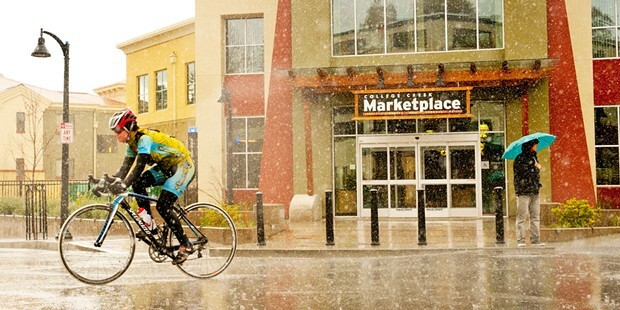 A cyclist braves the downpour on the trip through Humboldt State University’s campus. Rain. Rain. Here to stay. Inside or out, it's time to play. Don't let the seasonal sky drops cramp your winter and spring style in Humboldt. The precipitation precipitates fun and adventure. In Prairie Creek, by car or boots, the redwood forests are at their most magnificent. At the Eureka zoo, water-loving otters play unperturbed. Indoor excursions offer dining pleasures and endless amusements, as well, whether you dine on elk burgers (not made from the local Roosevelts!) in Orick or oysters and fudge in Trinidad, or go in for beads, marbles, crafts, drafts and big-name shows galore in Eureka and Arcata. Round it all out in tiny library nooks throughout the county, where the kids can do an impromptu puppet show with dragons or read a story to a friendly dog, all under one Roof. Roof. Roof. A herd of Roosevelt elk. No matter which size adventure you choose, you will be winning at Prairie Creek Redwood State Park. If one small adventure isn't enough, do a combo of two or supersize to all three. Small: Rain or shine, from the comfort of your car, you can view fine specimens of North America's largest elk, the Roosevelts, as they browse the winter watered meadows around the park. South of Orick, the marsh and manicured grass of Big Lagoon and the little Red School House serve as veritable elk magnets. North of town, the Prairie Creek prairie and aptly named Elk Meadows do the same. 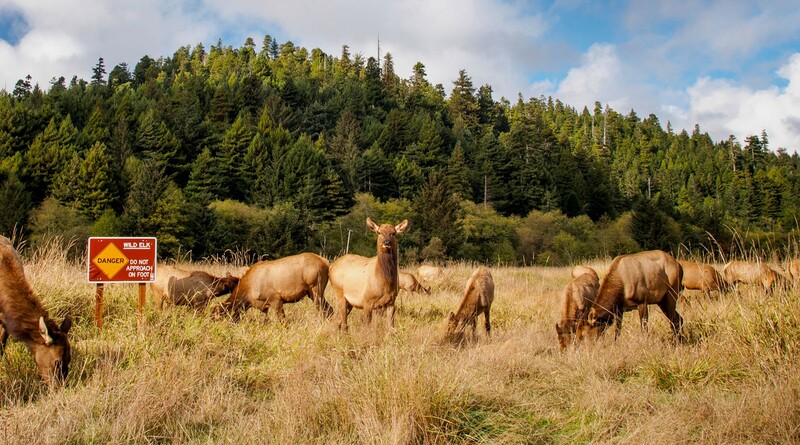 The lawns around the Redwood Adventures cabins are equally pristine since the elk serve as de facto mowers. Wandering male bulls, some weighing as much as half a ton, roam much of the park, including along the Gold Bluff Beach near Fern Canyon. Watch out for strays in the forest, as they sometimes use the trails made for two-legged travelers. Medium: Next to Elk Meadows is the trailhead for Trillium Falls Trail, a little known but exceptional hike that features a variety of tree species, as well as the prettiest and largest cascade in Redwood National and State Parks. 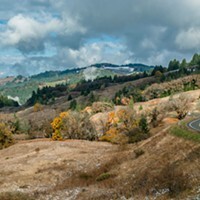 This moderately strenuous 3-mile loop will take you over rolling hills, into riparian and redwood forests, up climbing switchbacks and over an elegant steel bridge that offers a close-up view of the rocky falls. Look for Pacific rhododendron and western trillium, which flourish along much of the trail, and a clump of big burned snags that stand starkly and darkly, like exclamation points against the otherwise green backdrop. Humboldt outdoor gurus Gisela and Jerry Rohde consider this one of the best short hikes in RNSP. No doubt you will agree. Large: From the Prairie Creek Visitor Center (be sure to spy the Elk Tree with antlers sticking out of it), you can sample perhaps the most rewarding stretch of trails in Redwood National Parks, the James Irvine Trail, a 4.5-mile downhill jaunt that, after meandering among some of the sanctuary's finest old growth redwoods, ends with a flourish at Fern Canyon, one of the most remarkable gorges in the world. Noted as the film site for Jurassic Park 2 and other dino-centric movies, the canyon, its 70-foot sheer walls draped in luxurious ferns, inspires visitors in all seasons. But winter in particular offers the most delights, when its many species of ferns wear their finest greenery and its many waterfalls gush forth most robustly. The road to the canyon is normally closed during the wet season, so you may have to hike back the same way or take a slight loop detour on the Clintonia and Miners Ridge Trail. Wear sturdy boots to slosh through the canyon creek and stop for a spell on Gold Bluff Beach before the return to the visitor center. Near the main bluff overlooking Trinidad Bay, the Trinidad Bay Eatery & Gallery, a diner-gift shop combo, serves reliable steak, seafood and more American fare, much of which is local. Try a clam chowder bread bowl (huge), portabella mushroom sandwich (hearty), a pan-seared salmon with Thai Parmesan vinaigrette (delish) or Humboldt Bay oysters for dinner (yum). Wrap it all up with the popular blackberry cobbler and ice cream (mandatory). Not in the mood for food? The other side of the Trinidad Bay Eatery & Gallery showcases award-winning local and regional artists and sells thoughtful keepsakes, including redwood curios, local goat milk soaps and souvenir magnets. And you have the green light for a sample of their homemade fudge, which they pretty much hand to anyone who walks in the door. In the town of Orick, the proud home of the world's tallest tree — well, actually, it's in nearby Redwood National Park — a modest outdoor-seating-only cafe along U.S. Highway 101 cooks up an ambitious signature meal: elk burgers. EdeBee's Snack Shack — don't let its appearance deceive you — frequently attracts lines of locals and visitors for lunch and afternoon eats. The Bigfoot, Flaming Redwoods and Prairie Creek burgers leave the kitchen on a steady basis. Those seeking an extra special treat put in for the 8 Point Rack or Great Hunter Burger, made from tasty elk meat (not the endangered Roosevelts roaming the park). Fries, Tater Tots or onion rings round out the classic American meal with a wild twist. EdeBee's tortilla wraps and made-to-order sandwiches earn praise from particular palates, too. Don't waffle when it comes to making the right meal move. Actually, do waffle, at Root 101 Nursery in downtown Rio Dell in Southern Humboldt. 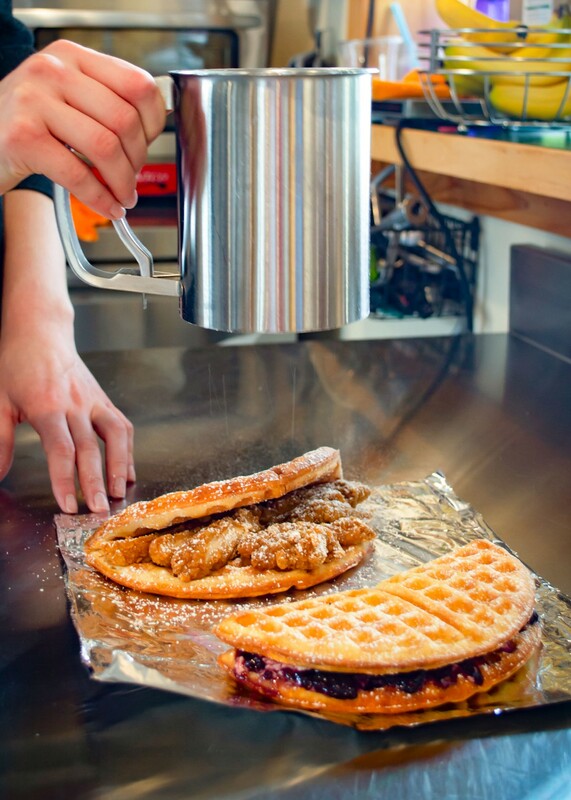 In one corner of the store, the counter crew at Wildwood Waffles batters, irons, tops, wraps and serves delicious dough semicircles for breakfast and lunch. Want sweet? Try the Plain Jane, Cinnablonde or Blackout, drenched or sprinkled with butter, powdered sugar, jam or whipped cream cheese. Savory? The Rio Deal and the Benji blend maple butter, bacon, eggs or cheese. 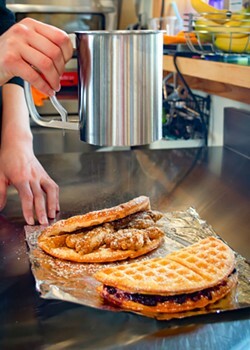 Want traditional chicken and waffles? No problem! The SoHum packs in breaded organic chicken (not deep fried) with maple syrup and powdered sugar. Skip the bacon add-on and go for the tangy jalapeño jelly instead. All are made from scratch using many local and organic ingredients. Served with local organic coffee. Open until 2 p.m. weekdays, 3 p.m. weekends. 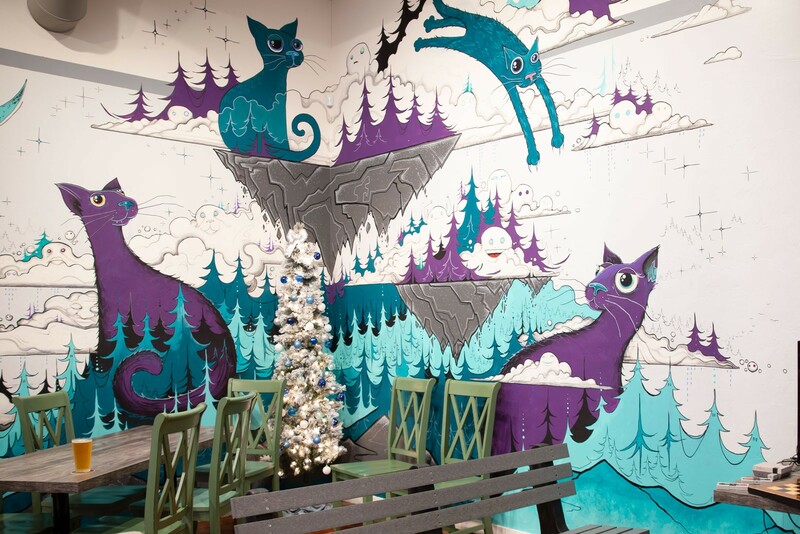 Arts and Drafts’ cool and quirky interior, with mural by Bradnon Mononoke. Do a craft. Drink a beer. What could be better? 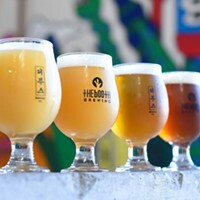 How about doing both together at Eureka's newest crafty hotspot, Arts & Drafts, a 2,000-square-foot space in Old Town? Housed in the historic E. Janssen Building, between the Gazebo Plaza and the waterfront, A&D boasts big natural light, rows of smocks on hooks, sturdy tables, armchairs, love seats, free wi-fi, painting supplies, knitting gear and a 16-foot bar built by Eureka's own world renowned bar maker, Barry Heaslet, on which to rest pints of Humboldt's finest local beers, wines, ciders and non-alcoholic beverages. So, whether on your own or in a class, you can sew, paint, build and sip to your heart's content. Express your creativity alone, with friends or strangers — for now. Opens 5 p.m., 3 p.m. on weekends and closed on Mondays. Draw a bead on the best when making or fixing your own crafty jewelry by aiming your feet towards Heart Bead, an Arcata tradition since 1990. "They can fix things, redesign things, come up with a zillion beautiful options and teach you how to make beautiful things yourself," gushed one of many satisfied Beadians. Bins and boxes overflowing with countless tidbits, ranging in price from 3 cents to $6 each, cover the store's floor and walls. Besides its friendly staff, which, it has been noted, don't mind tiny tots wandering about, the Plaza storefront is known for its monthly DIY classes, which will include stone wrapping (perfect for agates and shells and beach glass), pearl knotting (using silk cord and tweezers to string pearls), woven wire ring making (weave a wire bezel around a center bead to embellish your ring) and Tree of Life workshop (hammer a wire ring that encircles a tree of life with semi-precious stone chips) in early 2019. Call in advance to reserve a spot. Eureka isn't losing its marbles — it's gaining them, thanks to Soulshine Arts, an up-and-coming glassblowing studio in Old Town. Browse the gallery for mind-blowing creations in which flame-broiled silica has been transformed into swooping swans, tiny turtles, lava-like lamps, ethereal earrings and, our fave, jumping jellyfish. Better yet, in an evening class in the hotshop studio, glass up your own glamorous goods, first and foremost, marbles, marbles, marbles. Owners Ember and Willo are crazy about them, whether making, sharing or hiding them around Humboldt County during the second annual Humboldt Marble Weekend, Feb. 7-10. Bonus Tip: Soulshine Arts has expanded into a window front studio in downtown Ferndale. Walk by with the kids at your own risk. They will mistake the flame torch for a light saber, see marbles born before their eyes and insist on watching for the next hour. 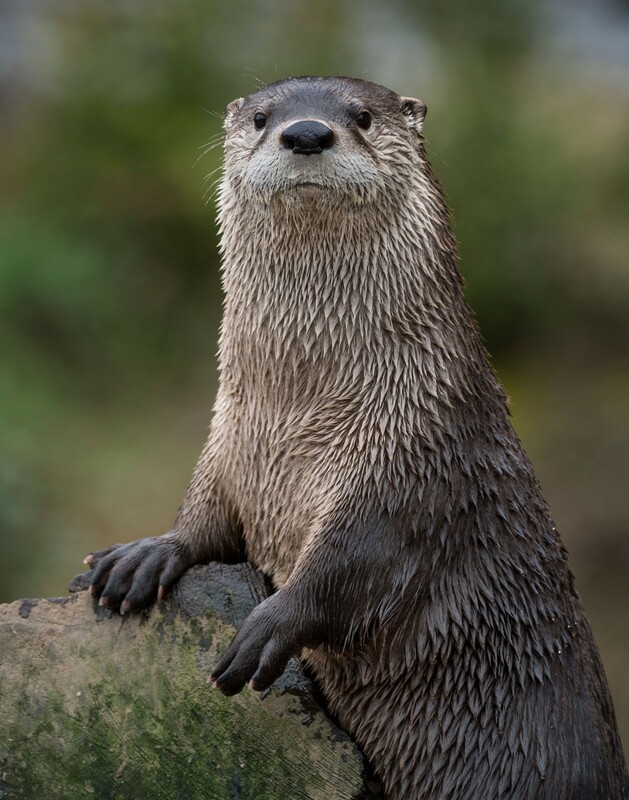 Otters have become a perennial favorite at the Sequoia Park Zoo. 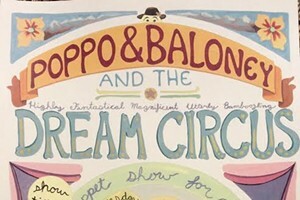 Scattered throughout Humboldt, in towns large and small, county libraries offer great mind diversions for children from near and far. The Eureka flagship, naturally, boasts the most, with a dollhouse, giant pillows, puzzles, a pizza making set, building blocks, educational computer games, a panoramic bay view window and frequent book readings for babies on up. However, tiny branches should not be overlooked, their many kids' sections and rooms providing silly sanctuaries for the small ones. Arcata welcomes with a comfy couch, Willow Creek with Bigfoot-related materials and Ferndale with a welcoming neoclassical façade, circa 1909, which could have been dreamed up by Norman Rockwell. The collection in Trinidad, with wild critter tracks imprinted in the sidewalk leading the way, offers a variety of hand puppets, a cozy kids' corner, rocking chairs and frequent opportunities to read books to a gentle service dog, trained specifically for the purpose. Call each location for hours, days and events. The winter rains may dampen the enthusiasm of some residents of the Sequoia Park Zoo in Eureka but a few don't mind the pitter patter at all. The river otters, three siblings engaged in perpetual play, keep splashing, wrestling and curiously staring at the human folk from their underwater otter park and viewing tube. The neighbor fish, local salmon and trout, continue to glub-glub-glub in their outdoor aquarium. In the petting zoo barn, the resident skunk and opossum sleep unperturbed in a little nook, into which children can peek without intruding. However, the best hideout for animals and people alike on damp days is the Secrets of the Forest room, where one may find banana slugs, a giant Pacific salamander, a bale of swimming pond turtles, termite log with kinetic flashlight, microscope nature lab, watershed map with blinking lights, interactive bird voices and snakes — lots of snakes, including rubber, king and gopher specimens — basking in heated splendor in branches, rocks and water dishes. Little has changed at the E & O Lanes since it opened in the 1950s. A locally owned institution a few miles east of Arcata off State Route 299, it has old-school manual scoring, no television sets and a jukebox with early rock 'n' roll standards. Patrons are likely to be called "hon" when they pick up their bowling shoes at the counter. Games and shoes are only $3 on Fun Day Mondays when bowlers can win a free game if they get a strike that includes a red pin. An air hockey table, a few old-school arcade games and three pool tables await for those who would prefer not to aim for strikes in the 12 bowling lanes. For grownups, adult beverages are available in the 13th Lane Bar. 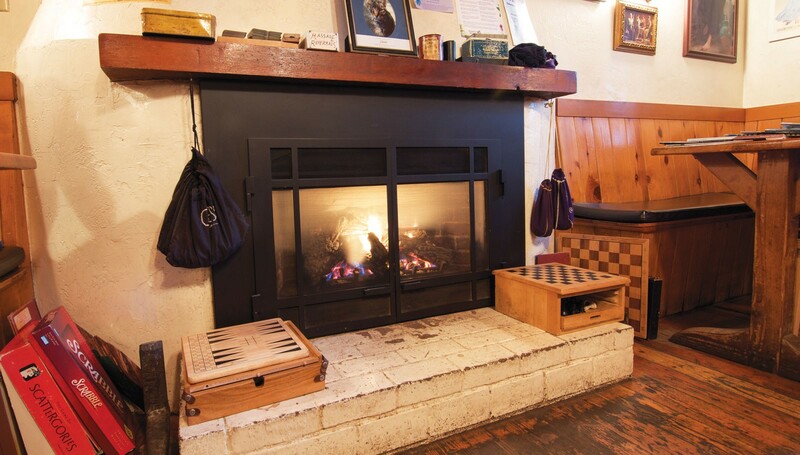 Stay warm and cozy with Cafe Mokka’s hot tubs and fireplace. An Arcata oasis since 1982, the Finnish Country Sauna & Tubs and Cafe Mokka provide the perfect private respite after a hike in the redwoods, rejuvenating tired muscles and appetites. The clothing-optional, wooden outdoor tubs and sauna cabins (sporting grass roofs, western red cedar interiors and natural light) are completely private but guests can otherwise wander (clothed) about the landscaped walled paradise, complete with frog pond, picturesque bridge and Scandinavian forest of birch and conifer trees. While the sauna and tubs are inspired by Scandinavia, the house coffee shop, Cafe Mokka, was named for an establishment in Barcelona, Spain, cited in a George Orwell novel. Crammed with board games, newspapers and books, and featuring Old-World style espresso drinks, a fireplace and a black cat named Leonard, the café draws locals and non-locals alike for lively conversation and diversions. Besides coffee, it serves Italian sodas, teas and juices, as well as pastries, open-faced sandwiches, soups and homemade breads. For the steam sweaters and hot water soakers, reserve in advance, especially on weekends and around Valentine's Day. The Sanctuary, a performance space and playground for artists, craft people and musicians, is Arcata's foremost clearinghouse of creativity. It seems to do it all. Gallery exhibits, live music, events, workshops, a printmaking lab, ceramic studio and food garden. Want to weld? Sew? Sketch? Read? Make jewelry? See live music? You can in the Sanctuary. Housed in the historic Arcata Women's Club, the nonprofit hosts open labs one or several days a week for guests to use the studios and workshops while experienced artisans offer guidance. Check the calendar for musical acts, too. Bluegrass, zydeco, ethereal, ambient, solo, multi-piece, tight, unbound, exploratory — it all resonates from the Sanctuary.